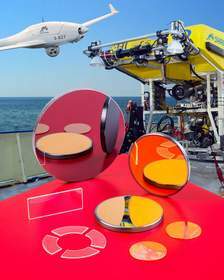 PROVIDENCE, RI--(Marketwired - May 20, 2014) - Meller Optics, Inc. has introduced custom fabricated sapphire, germanium, and zinc selenide optics for use in gimbaled systems and for front surface protection in unmanned air- and undersea vehicles. Available in a wide range of shapes and sizes from 0.25" to 10" dia., with varying wall thicknesses, Meller Optics for UAV and UUV applications can incorporate stepped edges and elliptical edge shaping, holes, slots, and wedges for mounting. Flatness can be held to 1/10th wave in the visible and < 2 arc sec. in/in parallelism, with surface finishes from 60-40 to 10-5 scratch-dig, depending upon material and configuration. Founded in 1921, Meller Optics has been providing high quality optics to defense, medical, laser, and industrial markets for 90 years now. Specializing in the grinding and polishing of hard, durable materials such as sapphire and ruby, the company has also developed high-speed, low-cost finishing processes for a variety of optical materials such as laser glasses, fused silica, zinc selenide, germanium, silicon, fluorides, and ceramic materials. Configurations include windows, substrates, lenses, domes, and prisms. Meller Optics is ISO 9001:2008 certified and in addition to providing standard, off-the-shelf products, they custom fabricate components that meet exacting specifications from delicate, difficult to work with optical materials. They also supply quality Microlux Alumina polishing abrasives and Gugolz optical polishing pitch. About this company Meller Optics, Inc.
Meller custom fabricates optics for use in gimbaled systems and for outboard surface protection in unmanned air and undersea vehicles.